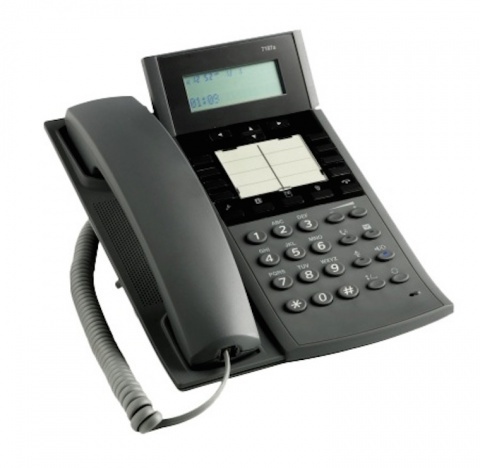 The most advanced telephone in the MiVoice 7100a range of analog telephones – sophisticated, practical and extremely user friendly. The telephone incorporates a wide range of features designed to make business or home communications as effective as possible. The hands-free speaking function, ideal for telephone and conference meetings, and the alphanumeric LCD display that can be easily tilted for a perfect view that displays the calling number, time, date and duration of call, as well as the last-dialed numbers are only some examples. Other useful features are the integrated telephone book enabling dial by name, an integrated headset port allowing a headset to be plugged directly into the telephone – with switching between the headset and the handset controlled by a key, a mute key for switching off the microphone and redial memory for fast access to dialed numbers.